Stretches for the lower extremities are key to helping your chiropractor relieve your back pain. The literature suggests strong links between tight muscles in the lower extremities as well as a lack of hip motion and low back pain. All of the bodies joints work together to share loads and accomplish functional ranges of motion. 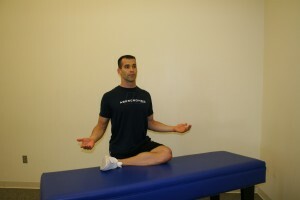 When a joints range of motion or stability is limited, other joints have to compensate. This compensation method the body uses to share forces and duties of joints often causes dysfunction of those joints. The resulting joint dysfunction leads to early joint degeneration from either an overuse/unstable joint or an underused/fixated joint. In an attempt to keep the back and lower extremity joints healthy (hips, knees, ankles) all people should perform a daily stretching program to increase the range of motion of the joints which are lacking, and a stability program to target the joints that are unstable or overused. Your Chiropractor will be able to screen you for these dysfunctions and design a custom program to correct and optimize your joint motions. The following are some suggestions and examples of lower extremity stretches designed to help lengthen a muscle to increase a joints functional range of motion. Daily stretching routine will achieve maximum results.